Motorcycles offer very little protection for their passengers and can be challenging to operate in adverse driving conditions. Their small size also makes it difficult for other motorists to see them. Because of this, there are more injuries and fatalities associated with motorcycle accidents than with car accidents. 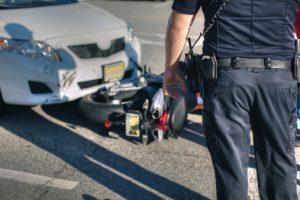 The Little Rock attorneys at the Minton Law Firm have extensive experience representing victims of motorcycle crashes and other traffic accidents. Unfortunately, not every accident can be prevented. We’ve helped motorcyclists who were in accidents caused by everything from negligent drivers to poor roadway conditions. If you or a loved one was hurt in an Arkansas motorcycle accident, the Little Rock motorcycle accident lawyers at the Minton Law Firm are here to help. Schedule your free consultation by calling us at 501-404-5433. The most recent data on motorcycle accidents in Arkansas comes from the 2014 traffic crash statistics report prepared by the Arkansas State Police. That year, there were 1,326 motorcycle accidents. These crashes resulted in 1,108 non-fatal injuries and 67 fatalities. Of these fatalities, 42 were riders who were not wearing helmets. National statistics from the Insurance Information Institute show there were 8.6 million motorcycles on the road in 2015. That year, 88,000 motorcyclists were injured and 4,976 were killed; an 8.3 percent increase over the fatalities seen in 2014. Decades ago, most motorcyclists killed in crashes were young men. In fact, over 80 percent were males 29 years old or younger. That’s changed in recent years. Now, the majority of motorcyclists killed in accidents are 40 or older. While it is true that age is a factor in motorcycle injuries and deaths, it isn’t the only reason why accidents happen. Roughly 75 percent of motorcycle accidents involve a passenger vehicle. According to data from the National Highway Traffic Safety Administration (NHTSA), approximately half of the motorcycle fatalities in 2015 were caused by collisions with other vehicles. Most of these accidents are cause by motorists who simply don’t see the motorcyclist or fail to yield the right of way. A staggering 41 percent of the deaths in 2015 happened when vehicles turned left in front of motorcyclists. Of course, motorcyclists can cause accidents too. Tailgating – Some drivers underestimate the amount of space they need to come to a safe stop. Lack of knowledge – New motorcyclists should be especially careful when riding. Not knowing how a bike works and how to operate it safely could cost the motorcyclist their life. Blind spots – People driving cars may not be aware that it’s very easy for a motorcyclist to be hiding in their blind spot. That said, motorcyclists should also be aware of driver’s blind spots and do their best to avoid sitting in them. Lack of awareness – Some motorcyclists are simply unaware of how dangerous the bikes can be. They may think their small size, maneuverability and quick speed makes them safer when, in reality, the opposite is true. Improper turns – Since motorcycles are small, they may appear to be further away than they really are. This can cause the driver of a car to miscalculate how much time they have to change lanes or make a turn, and result in them running the motorcyclist off the road. Unrefined skills – Cornering and braking are two aspects of motorcycle riding that take some time to learn. Handling a corner wrong or braking too hard can cause the bike to become unstable and crash. Speeding – Excess speed makes it difficult for both drivers and motorcyclists to react in the event of an emergency and can increase the severity of injuries caused by accidents. Failure to drive defensively – Motorcyclists and drivers have an obligation to practice defensive driving and ensure they are in a position in their lanes where they can see and be seen by other motorists. Distracted driving – Both motorcyclists and motorists have the tendency to be distracted by their phones, the radio, or passengers. The truth is, distracted driving takes thousands of lives each year but can be easily prevented by paying attention and using common sense. Motorcyclists wear special gear to keep them safe, but even the best gear can’t prevent every injury. Some motorcyclists are lucky enough to walk away from accidents with minor scrapes and bruises, while others suffer catastrophic injuries. If you’re ever involved in a motorcycle accident, stay calm. Your body will be in shock and your mind will be struggling to make sense of what just happened. Remaining calm will help you handle the situation safely and effectively. One of the first things you should do after a motorcycle accident is contact local law enforcement or call 911. The adrenaline your body produces after a traumatic event can make you feel like you’re fine when you’re not. You must take special care to evaluate the extent of your injuries before you do anything that could potentially make them worse. If you hit your head, landed on your neck or back, or rolled several times, you may have suffered serious injury. If this is the case, it’s best to sit still and avoid moving until paramedics arrive. Call 911. They will send police and an ambulance. Even if you aren’t injured, you need to call so police can respond and file a report. Find a safe spot. Get away from the road as soon as you can. If possible, move your bike so it does not obstruct traffic or cause another accident. Talk to witnesses. If someone else saw the accident, get their contact information. Take notes. Write down everything that happened leading up to the accident. Record the date, time, location, weather conditions, and anything else you think might be important to your case. Take pictures. Photographs are on of the best forms of evidence you can have. Take pictures of your injuries, the bike, other vehicles that were involved, and the area where the accident happened. Go to the doctor. Even if you don’t visit the emergency room, you should see your primary care doctor just to make sure you’re OK. Notify your insurer. Once things start to calm down a little, you should call your insurance company to file a claim. Hire an attorney. The sooner you hire a lawyer the sooner they can get to work on your case. If you’re dealing with injuries and treatment, having an attorney can take some of the stress of the situation off your plate. Don’t leave the scene. Stay put so you can talk to police, unless you’re being taken to the emergency room. Don’t confront the other motorists involved. Being in a state of shock makes it very easy to say something that could compromise your case. The police will handle talking to the other drivers so you don’t have to. Don’t speculate. It’s best to keep quiet and only share your opinions or thoughts about the accident with your attorney. Don’t give a recorded statement. After you file a claim with your insurance company, an insurance adjustor will probably contact you and ask you to give a recorded statement. If this happens, ask to reschedule for a time when your lawyer can be present. Don’t accept settlement offers. The first settlement insurance companies offer is almost always much lower than what you’re entitled to and, if you accept one, your case is essentially closed. Always discuss settlement offers with your attorney before accepting. Don’t worry. Do your best to relax and know that the Minton Law Firm is fighting for your best interests. We know that going through an accident is never easy. It can be emotionally trying, physically painful and financially stressful. If a life is lost, it will leave a tremendous void that can’t be filled by any amount of money. Money can’t make up for pain or loss of life, but it can help you and your family begin to move forward. We’ve helped many people get the compensation they deserve so they can get back on the road. If you’ve suffered injuries or lost a family member in a motorcycle accident, schedule a free consultation with the Minton Law Firm to find out what your case may be worth. Our lawyers represent injury victims from the greater Little Rock area and throughout Arkansas.